Amble is a fully adjustable LED task light of single-piece construction that redefines the genre. It is stylish and simple with only one moving part to create a minimalist aesthetic. Through ingenious contemporary design, Amble offers three lighting positions. 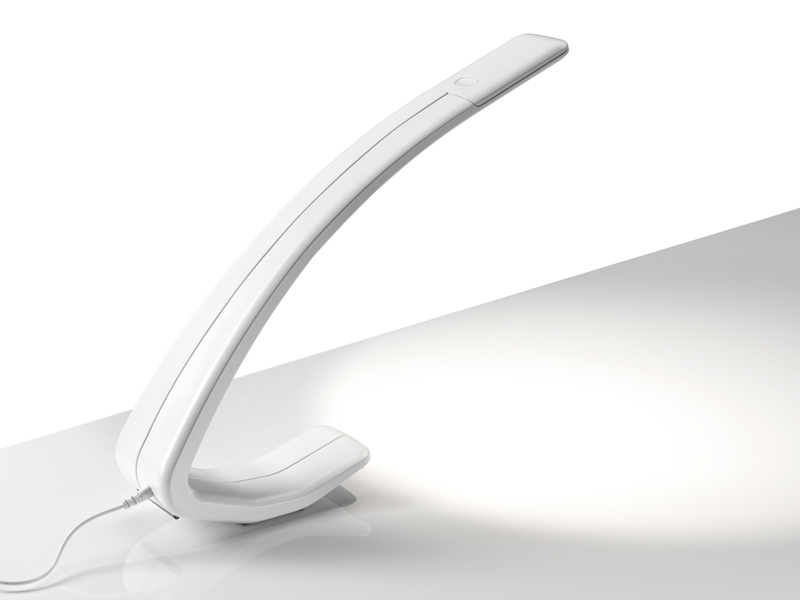 At its tallest position, Amble provides ambient light that helps reduce eyestrain in everyday work environments. When moved into its intermediate posture, Amble shines as a multi-purpose LED task light. Tilted to its lowest point. Amble provides concentrated light for tasks such as reading. Smooth to the touch with no joints or hinges, Amble’s lean silhouette features intuitive single touch on/off and touch-and-hold continuous dimming, all encompassed within its minimal footprint. To help minimise energy use, Amble’s touch dimmable 206 lumen LED light automatically turns off after 10 hours of inactivity. Ergonomics Amble’s ergonomic adjustability promotes wellbeing in the workplace. Its only moving part is a self-articulating lightshade that moves automatically with the position of the light. And for clarified focus to ambient lighting, Amble can illuminate open plan spaces for people who are not near a natural light source. Created by Stephan Copeland, an iconic, internationally acclaimed and innovative designer, and manufactured by LightCorp, a distinguished lighting manufacturer. Amble is solely distributed by Colebrook Bosson Saunders within Europe.